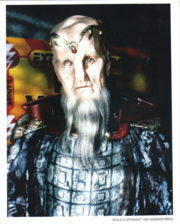 This is a 9″ action figure of Ambassador G’Kar from the second release of Babylon 5 9″ action figures, assortment #20041. This assortment was produced by Diamond Comic Distributors in 1997 and never released in the mainstream stores, but rather only to comic book, fantasy and gaming stores, so the distribution was not very good. This is a MINT figure, in a MINT display box, that we took straight out of an unopened case to take this picture then returned to the case. This is a 6″ action figure from the third release of Babylon 5 action figures, assortment #20051. It features the image of the character of Lyta Alexander with gloves, which was the variant version of this action figure. This assortment was produced by Diamond Comic Distributors in 1997 and never released in the mainstream stores, but rather only to comic book, fantasy and gaming stores, so the distribution was not very good. This is a MINT figure, on a MINT blister card, that we took straight out of an unopened case to take this picture then returned to the case. This 2.5″ x 1.75″ metal enamel pin is a reproduction of the Ranger Pin Insignias worn by the Rangers on the hit TV series Babylon 5. This had limited release and is not easily found. Our scan does not do it justice. This is a cloth baseball style hat with a mesh back with the Babylon 5 TV Series Ranger Uniform logo patch attached to the front. This is a new, never worn hat, available in either blue or black. If you do not choose we will send our choice. 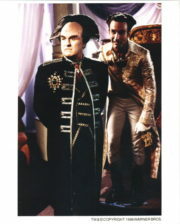 This is a 9″ action figure of Captain Sheridan from the second release of Babylon 5 9″ action figures, assortment #20041. This assortment was produced by Diamond Comic Distributors in 1997 and never released in the mainstream stores, but rather only to comic book, fantasy and gaming stores, so the distribution was not very good. This is a MINT unopened figure, in a NEW display box, that we took straight out of an unopened case to take this picture then returned to the case. This is a cloth baseball style hat with a mesh back with the Babylon 5 TV Series Shield Uniform logo patch attached to the front. This is a new, never worn hat, available in either blue or black. If you do not choose we will send our choice. This is an 8″ x 10″ photograph of Alfred Bester from the hit sci-fi TV series Babylon 5. This is a licensed photo that is new and unused, purchased by us from the printer. 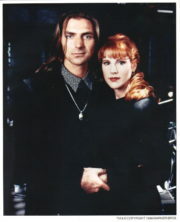 This is an 8″ x 10″ photograph of Byron and Lyta Alexander from the hit sci-fi TV series Babylon 5. This is a licensed photo that is new and unused, purchased by us from the printer. This is an 8″ x 10″ photograph of Capt. John Sheridan from the hit sci-fi TV series Babylon 5. This is a licensed photo that is new and unused, purchased by us from the printer. 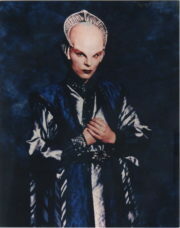 This is an 8″ x 10″ photograph of Delenn from the hit sci-fi TV series Babylon 5. This is a new and unused photo purchased by us from the printer. 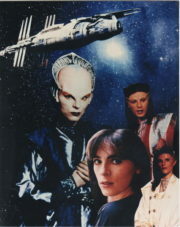 This is an 8″ x 10″ photograph of Delenn in a collage form from the hit sci-fi TV series Babylon 5. This is a new and unused photo purchased by us from the printer. This 3″ x 1.25″ metal pin is a reproduction of the Chest Insignias worn by the crew of Babylon 5 on the hit TV series. Produced in the 1990’s and now out of production, this has limited release and is not easily found in the United States. 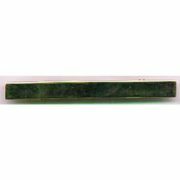 This pin is a bright blue, with gold trim. Our scan does not do it justice. It is stored in a smoke and pet free environment. 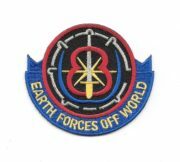 This is a new, unused, embroidered 3.375″ wide patch, seen on the shoulders of the uniforms of the crew of the Babylon 5 station on the hit TV show of the same name. This is an 8″ x 10″ photograph of Londo Mollari from the hit sci-fi TV series Babylon 5. This is a licensed photo that is new and unused, purchased by us from the printer. 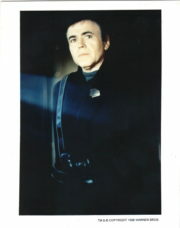 This is an 8″ x 10″ photograph of Lorien from the hit sci-fi TV series Babylon 5. This is a licensed photo that is new and unused, purchased by us from the printer. This is an accurate reproduction of the wrist communicator as seen on the hit TV series Babylon 5. Produced by a company in Germany (now out of production) this had limited release and is not easily found in the United States. 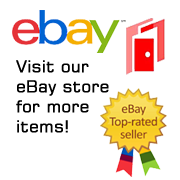 Use double sided sticky tape on the back to attach it to your wrist. 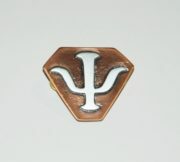 This 2″ x 2″ metal badge is an exact reproduction of the PSI Corps insignia worn be Bester and the other members of the PSI Corps, as seen on the hit TV series Babylon 5. Produced by a company in Europe (now out of production), this had limited release and is not easily found in the United States. Our scan does not do it justice. 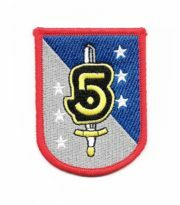 This is a 3″ x 1.75″ mint, embroidered patch of the logo of the Rangers, as seen in the hit TV series, Babylon 5. This is a 3″ x 2.5″ mint, embroidered patch, seen on the shoulders of the uniforms of the crew of the Babylon 5 station on the hit TV show. 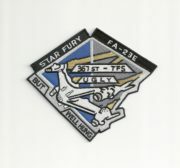 This is a 6″ x 5.25″ mint, embroidered patch of the logo of the Star Fury fighters, as seen in the hit TV series, Babylon 5. 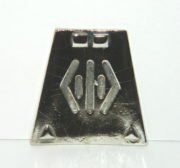 This is a 4″ x 1.75″ mint patch of the command emblem patch, as seen on the chest of John Sheridan, Ivanava, Lockley and others in command, on the hit TV series, Babylon 5.